Slides from Michael Layne's presentation "XBMC on GNU/Linux & Android" from the July 24, 2014 LinuxBarbados meetup. LinuxBarbados is for people who are passionate about Linux and building great things with open source hardware & software. The group is based at the University of the West Indies (UWI) at Cave Hill, Barbados. Meetings happen via live video (like Google Hangout) so you can join from any place that connects to the Internet. Note: All times listed by LinuxBarbados are Barbados local time! 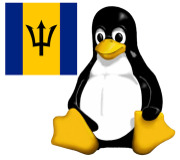 LinuxBarbados collaborates with RubyCaribe. Open source projects are in the LinuxBarbados Github repo. Upcoming events are broadcast via theLinuxBarbados Twitter feed.